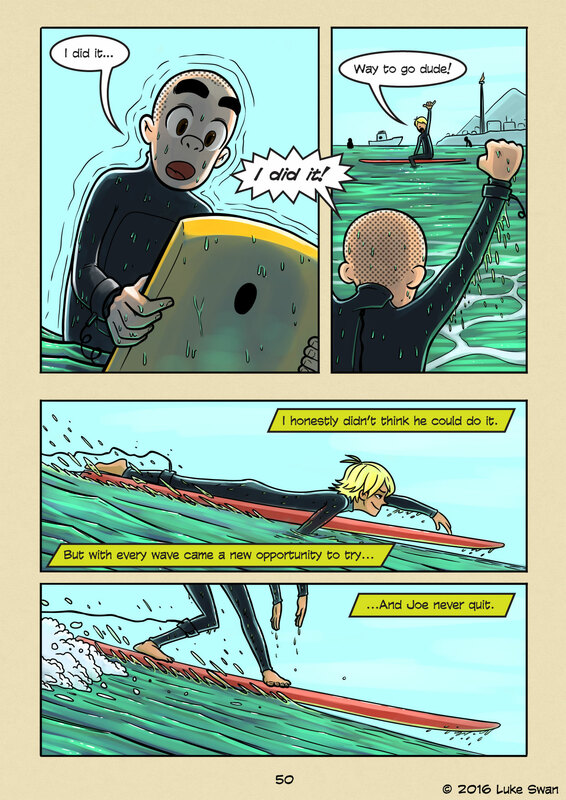 Every Wave is an Opportunity (#050) | Web comic "Surfer Joe"
This is one of my favorite quotes. Opportunities come by every day, but I think most people don’t notice them. Without practice and preparation, you may not know an opportunity when you see one. Which is why practice and repetition are so important. When you practice something over and over, your perception begins to change. You discover small things about your craft that a casual observer would never notice. These revelations lead to new discoveries, and they start to support each other. Skill begins to form. Once your perception changes, you begin to view the world differently. You begin to see opportunities all around you, and it’s up to you to seize them. Opportunity is limitless, like the waves in the ocean. Every wave is an opportunity. To catch, to stand, to ride and see how far it takes you. Every wave you catch makes you a better surfer. It isn’t just that waves are like opportunities, but the opposite is also true. Opportunities, like waves, will take you places if you have to courage to ride them. Each one has a different journey, and there is an infinite number of them. Please take a moment to vote for us on Topwebcomics.com! With enough votes, we can reach the front page of the site, which would help us spread the word. We are grateful for everyone’s love and support and work hard every day to make a story the surfers of Sendai can be proud of.